NEW YORK -- Steven Cohen's hedge fund, SAC Capital Advisors LLP, pleaded not guilty in federal court Friday, one day after it was indicted on insider-trading charges. The firm's general counsel, Peter Nussbaum, flanked by five defense lawyers, entered the plea before U.S. District Judge Laura Taylor Swain in New York. U.S. prosecutors Thursday charged the $14 billion hedge fund with presiding over a culture where employees flouted the law and were encouraged to tap their personal networks for inside information about publicly traded companies. Government-obtained evidence includes "court-authorized wiretaps" and "a large number of electronic recordings," such as emails and instant messages, Antonia Apps, an assistant U.S. attorney who has prosecuted other insider-trading cases, told the judge. Apps also said that the government would provide the bulk of its evidence to SAC within 30 days. Ted Wells, a lawyer representing SAC Capital, said he was "most concerned" with obtaining statements that former SAC Capital employees gave to the government. Wells, who said he has had discussions with prosecutors, told the judge the defense was entitled to the evidence as it prepares its case. Apps said it wasn't clear that the statements would have to be turned over to SAC lawyers. Wells didn't name anyone, but several former employees, including Noah Freeman, Jon Horvath, Donald Longueuil and Wesley Wang, have already pleaded guilty to charges of criminal insider trading. No criminal charges have been brought against Cohen. Swain didn't decide the issue but set a Sept. 24 court date to discuss evidence. SAC's illegal practices ran roughly from 1999 to 2010, according to the indictment. SAC and various affiliates were charged with four criminal counts of securities fraud and one count of wire fraud. Prosecutors also filed a civil case seeking forfeitures and money laundering penalties. The charges came a week after the U.S. Securities and Exchange Commission charged Cohen in a civil case with failing to supervise two employees, Mathew Martoma and Michael Steinberg. Both men have pleaded not guilty to criminal insider trading charges and face trials in November. Prosecutors are expected to ask the SEC to stay those proceedings while it pursues the criminal case. 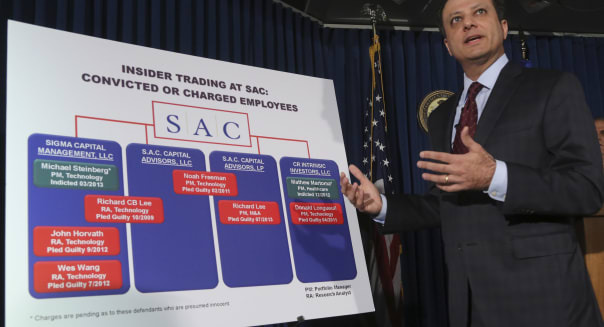 The main victims of SAC's alleged crimes are "large companies ... whose confidential information was stolen and traded upon," Arlo Devlin-Brown, another assistant U.S. attorney, told Swain. Suspect trades mentioned in the indictment include Cohen's August 2008 sale of a $12.5 million stake in Dell (DELL), within 10 minutes after receiving an email warning that someone at the computer maker had said the company's earnings would disappoint. SAC's lawyers Friday included: Wells, Daniel Kramer and Michael Gertzman of Paul, Weiss, Rifkind, Wharton & Garrison; and Martin Klotz and Michael Schachter of Wilkie Farr & Gallagher. Jonathan Gasthalter, a spokesman for SAC, declined to comment.